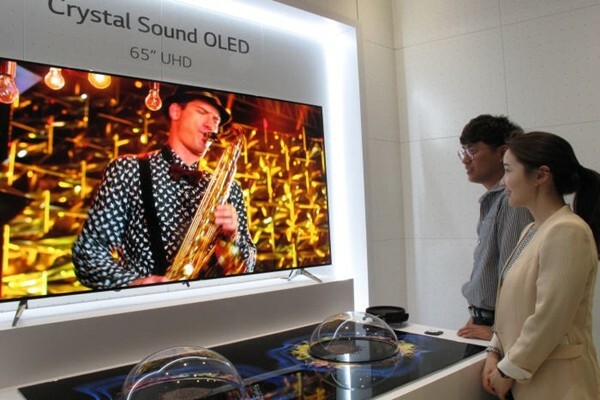 LG Display is planning to apply multi-channel sound technology to its next-generation CSO (Crystal Sound OLED). CSO is seen as a ‘dream technology’ that produces sound from a display. If sound comes from a screen, it will be able to maximize sense of immersion from a viewer as this screen is able to implement sound that is one with a screen. Although flat speaker technology has been available for years, research on development of a display that produces sound has been remote. “Direction of development of future CSO will be towards a way where sound is produced from multi-channels.” said Senior Researcher Park Kwan-ho of LG Display through an interview with The Electronic Times. Senior Researcher Park has been the task leader of LG Display’s CSO and he has led development of CSO at the front line of research on CSO. CSO is based on a principle that provides sound by making a screen vibrate. Exciter, which is an actuator part of a speaker, is attached on the back of an OLED panel. Exciter is a part that vibrates diaphragm so that sound can come out. CSO is attached to an OLED panel instead of a diaphragm and produces sound. LG Display is planning to apply multi-channel sound to its next-generation CSO and is busy with performing related research. Multi-channel sound indicates 4-channel stereo or 5.1-channel sound that provides sound from every direction. Because multi-channel produces sound from various channels, it increases sense of immersion and sense of space that viewers feel. CSO currently produces 2-channel stereo sound, which indicates three-dimensional sound. It implements location of an actual recording scene where sound is coming from as it is. Through stereo sound, viewers are able to feel sense of immersion as if they are on scene. In general, TVs are applied with 2-channel stereo sound that utilizes the left and the right channels. Enhanced R&D knowhow was applied for a process that overcomes interferences between channels of CSO and optimizes 2-channel stereo sound. Due to this, LG Display applied for about 40 patents related to CSO in South Korea and other countries. If multiple exciters are attached on top of single diaphragm, interference between channels is inevitable and this leads to poor sound quality. Interference between channels induces distortion and it damages sense of space and sound image. This is why multi-channel sound technology is seen as an advanced technology. Industries have made numerous attempts in order to develop displays that can produce sound. In case of LCD, it diminishes or distorts sound as there are many layers of gaps between panels. However because OLED does not have any space between panels, it is able to vibrate sound directly and it can minimize any changes in quality of sound. CSO is designed to vibrate panels upward and downward so that viewers cannot see any vibration of sound from a TV screen. Senior Researcher Park explained that human eyes can detect vibration of sound if panels are vibrated from side to side. Also panels are vibrated so fast and so finely that human eyes cannot see any vibration. As a result, viewers will not see any vibration even though panels are vibrating.